Thatch is the layer of living and dead stems, leaves and roots that builds up between the green layer of healthy grass and the soil surface. Some degree of thatch is a normal part of any actively growing lawn. How does thatch affect your lawn? A thin layer of thatch can be beneficial to the lawn because it helps to limit weed germination, reduce water evaporation, and protect from frost damage. 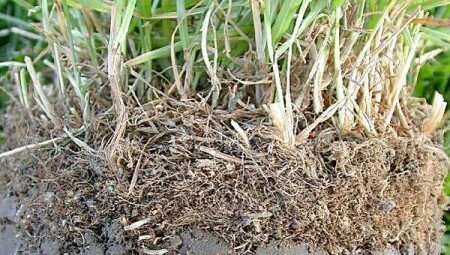 An excessive thatch layer however (3/4 to 1 inch or more when compressed) hinders the movement of air, water, and fertilizer to the roots. 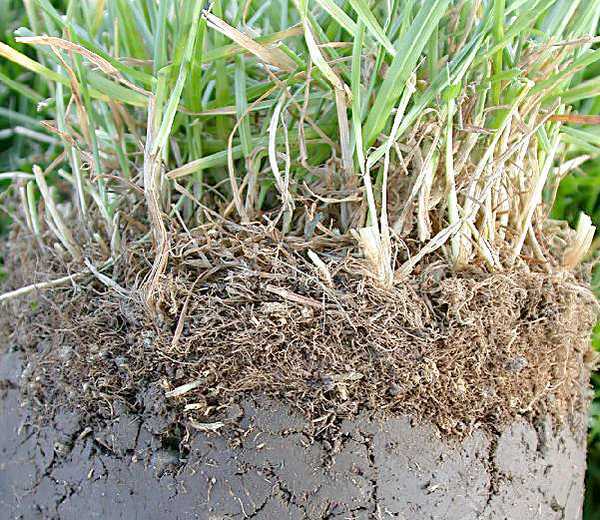 An excessive thatch accumulation can lead to lawn rooting into thatch rather than into soil. If the thatch stays moist, it can harbor organisms that can cause turf diseases. The overall effect of a thick thatch layer is having an unhealthy lawn that doesn’t respond well to treatment and is easily injured by bad weather conditions and pests.